Lahti is a city and municipality in Finland.Lahti is the capital of the Päijänne Tavastia region. Do some cultural sightseeing at Langinkoski Imperial Fishing Lodge Museum and Hame Castle. Get out of town with these interesting Lahti side-trips: Kotka (Maritime Centre Vellamo, Riverside Park, & more), Parola Tank Museum (in Parola) and Museo Militaria (in Haemeenlinna). 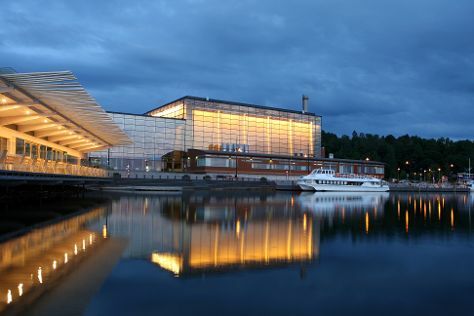 The adventure continues: get into the urban bustle at Sibelius Hall, examine the collection at Lahti Ski Museum, and take in the waterfront at Vesijärvi harbor. To see photos, maps, more things to do, and more tourist information, read Lahti tour app . Expect a daytime high around 8°C in April, and nighttime lows around -1°C. Finish your sightseeing early on the 24th (Wed) to allow enough time to travel back home.